There was a lot of this while I was in Chania. This one is a bit delayed. A bit more than a month delayed, in fact. 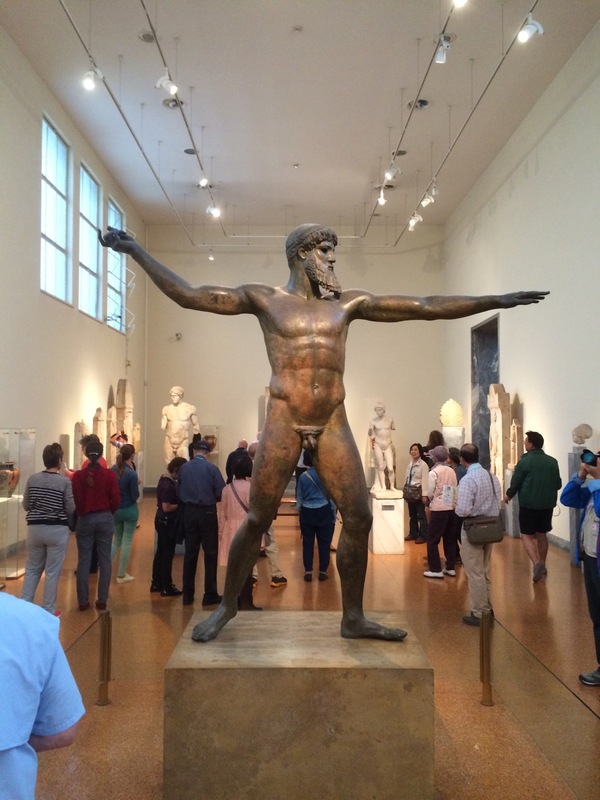 Apologies for that—I don’t like leaving things unfinished, and just because my Greek odyssey ended in quiet fashion was no reason to leave my audience (you’re out there, right? Is this thing even on?) hanging. 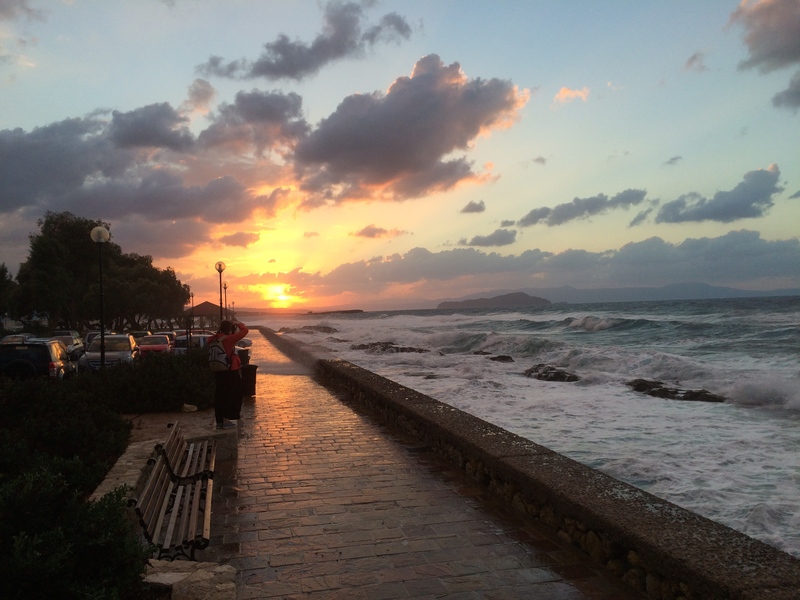 Chania, in the west of Crete, was a quietly pleasant way to wrap up my travels. Founded as Kydonia long ago in the Minoan age, it passed through the hands of multiple powers, both foreign and domestic, over the intervening centuries, all of which left their mark. No massive museums to rival those in Athens or Thessaloniki, or fortresses like those of Nafplio or Mycenae. Yet with a cafe tucked into a narrow alleyway, twisting streets filled with craft shops, the relics of Venetian fortifications, and an old church turned into a museum, with relics of the Ottoman occupation in the garden, there was more than enough to see. It would perhaps have been nice to spend an hour or so on the beach (or preferably in the sea), but wild weather and the first hints of autumn in the air put paid to that. I got plenty of the sea in my face just by strolling along the promenade, and the main adventure of my time in Chania was had the first night, making my way all along the long, crumbling breakwater to the old lighthouse, joining a French couple in climbing over the locked gates to do a little light trespassing for the sake of a good photo. So Chania was a place for resting and relaxing, either collecting my thoughts and resting tired limbs after more than a week of walking to and around new experiences, or steeling myself for the inevitability of a five-hour Ryanair flight and the cattle drive of the airport that preceded it. With that in mind, as well as the long gap between getting home and writing this, here are a few collected thoughts. Greece is utterly worth the effort. I’d waited for years to go there, and while I didn’t get to see everything I wanted (who could, in only ten days? ), I saw wonders. It’s a country of two parts. The Isthmus of Corinth has divided the Greek world for millennia, and it still does. To the north and east are the two main cities of Athens and Thessaloniki, connected by the country’s main railway. To the south and west is the Peloponnese, with smaller towns and cities, truly ancient ruins and wild hills, and no working railway. It’s a straight travel choice. Either travel by bus, of which there are plenty, or by car and risk Greece’s occasionally tricky roads and drivers. The risks of the latter are probably a little overstated, but then I didn’t have to deal with them. Being bus-bound wasn’t a major problem for me, but if you want to get off the beaten path, you’ll need a car. Get there early. Tour buses and the hordes they disgorge are the enemy. In Delphi and Mycenae, I got there before the worst of the crowds, and in Delphi in particular the result was magical. In Knossos I didn’t, and I ended up dodging the crowds and queueing up to see some of the best bits. Get comfortable with waiting. Service in Greece isn’t bad, it’s just not hurried. At all. Which should give you plenty of time to chill out, enjoy the ouzo or raki, and contemplate the meaning of life. Travelling with one bag? Not that I’m the first person to figure this out, but it’s perfectly doable, even when travelling for more than a week. Just make sure that you know where to find a laundrette, and be aware that bringing presents home is going to be limited, size-wise. Ditching the electronics… This is the second trip I’ve had where I limited my electronics to my phone alone. Given that I prefer to write freehand when I can, and that my iPhone is pretty capable, it wasn’t much of a sacrifice. The only issue is battery life—next time I’d bring a battery case. …paying attention to the details. My one big error on the trip was not realising that there would be so few ferries from Athens to Iraklio per day. I made the best of it in the end, getting to watch the close of the Ryder Cup in a Sports Bar, but the overnight trip was something I could have been better prepared for. Lesson learned—next time I’m not going to assume that everything will be convenient. Knee-stomping (really), whirling dancing fools. When one is given a chance to attend a full orchestral performance in a theatre some 1,900 years old, one doesn’t turn it down. 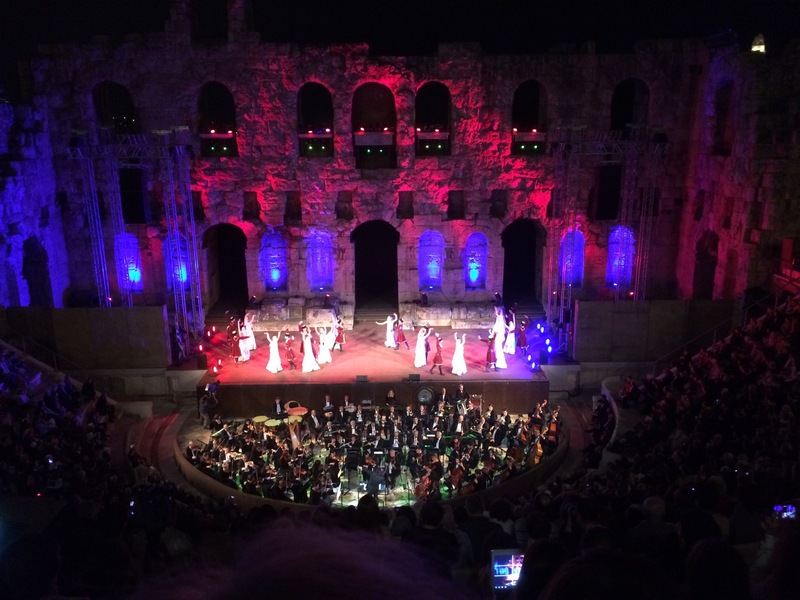 Thus it was that I found myself buying a €5 ticket to gain access to the Odeon of Herodes Atticus, in the shadow of the Acropolis, there to watch a performance by the Azerbaijan National Orchestra and several other Azerbaijani performers, notable among them a troupe of dancers. Whether or not the ticket seller was offering a dramatic flourish of his own when he said that I had bought the very last ticket, I can’t honestly say, but the Odeon was probably as full as it could be while still being safe. Likewise, I’m not exactly sure what the cultural links between Greece and Azerbaijan are – perhaps my attention wandered during the introductory speeches that took up a fair chunk of the evening. Still, there’s no arguing with the fact that the orchestra’s performance was very warmly received, whether they were accompanying other acts (including, incongruously, a tenor offering up his take on “Nessun Dorma”). The dancers turned out to be the stars of the night though, their kinetic leaping, whirling and shouting inspiring the audience to clap in time to every flourish as light and sound illuminated the inside of those ancient stones. Sublime history of another kind was the order of the day the next morning, as I made my way to the National Museum of Archaeology. With such a resource as the history of Greece to draw on, this could hardly fail to be spectacular, and as much as I may have seen more statues in the past two days than in the course of my life to date, I haven’t tired of them yet. The museum contains the Death Mask of Agamemnon (so called by Schliemann), several rare and exquisite bronze statues (far fewer of these survive from ancient times than their marble equivalents), and items both unspeakably ancient and of such quality of manufacture and art that you can’t help but linger over them. Possibly Poseidon, probably Zeus, definitely striking. Perhaps the most fascinating piece that the museum now holds is a relatively recent acquisition. In an ancient shipwreck off the tiny island of Antikythera were found not only a collection of sculptures (probably looted and on their way to imperial Rome) but a nondescript lump of fused bronze. 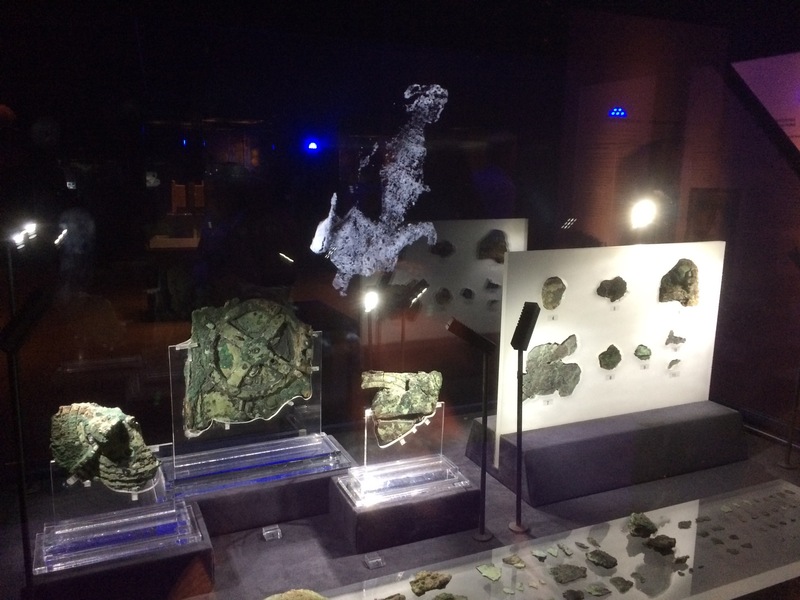 That lump, carefully studied over decades, now has an exhibition all to itself and is known as the Antikythera Mechanism. An intricate clockwork device, seemingly constructed to track and predict the motions of celestial bodies, it’s a glimpse into the little guessed complexity of ancient craftsmanship, forgotten for centuries afterwards. So much for the sublimity: whence comes the ridiculous of this article’s title? Well, I’ve supplied most of that myself as I’ve come to the last few days of this trip. For example, on my way to the museum, I managed to get completely turned around and found myself wandering through a mostly deserted park until I figured things out. Antikythera – A mechanism’s mechanism. I’m in ur background, bombing ur photoz. There’s a trope in film and television of using familiar landmarks to create a sense of place. If a scene is meant to be in Paris, the odds are that the Eiffel Tower will be lurking in the background. If it’s London, Big Ben and Tower Bridge serve the same purpose. If it’s Dublin, well, a pub will probably do fine. 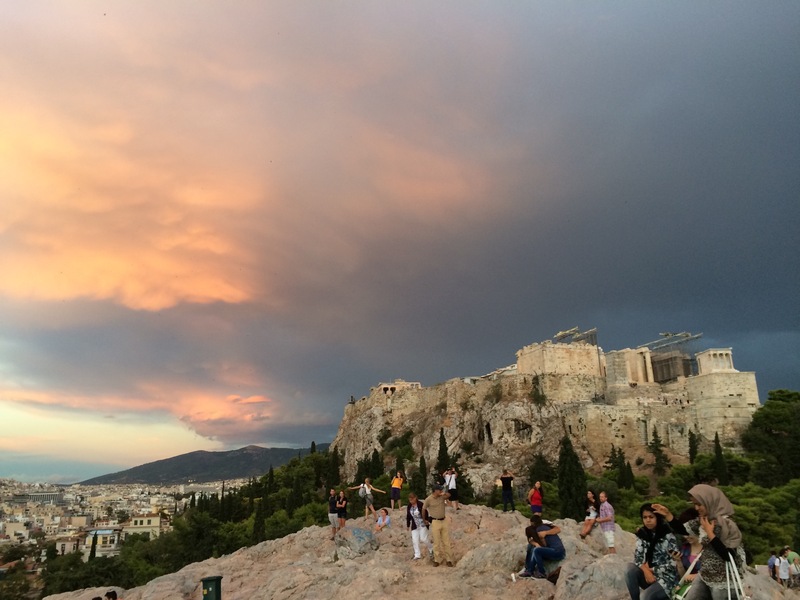 For Athens, the Acropolis and the Parthenon are the more than obvious choices as identifying landmarks. The difference being that when you’re in Athens, the Parthenon and Acropolis actually are in the background most of the time. It’d be a surprise if they weren’t, give that they’re built on a whacking great mountain in the middle of the city. For all that modern Athens now sprawls all across the Attic plain, its ancient past remains evident at its heart. The Acropolis stands out of course: there are Mycenean stones at its base, as in so many other places that I’ve visited, but habitation here goes back at least to the Neolithic. But it’s hard to go anywhere in the centre of the city and not come across reminders of the past. Plenty of the museum pieces that I’ve seen over the past two days have had notes attached saying that they were found in some construction project or other. It must make urban planning a nightmare here, perhaps more so than anywhere else on Earth. All around the city you can see building sites that have turned into archaeological digs, though how much of that is due to the economic downturn I couldn’t say. Even the Acropolis Museum has a glass ground floor, the better to show the craftsmen’s district uncovered during its construction. Tear your eyes away from the Pantheon and take a walk around Athens though and you’ll be well rewarded. In the shadow of the Acropolis alone, you have the Areopagus hill, where high crimes were judged. You have the Pnyx, where Athens’ ruling body of the people met. There’s the largely intact temple to Hephaestus and the mostly ruined but massive Temple of Olympian Zeus. In the ancient agora, you can see the prison where Socrates took his fatal draught of hemlock, and down the hill you can see the uncovered Kerameikos district, where he strove to open minds among Athens’ ordinary citizens, questioning their every assumption. Once again, it’s all about being close to history. Not just the history of a place like the Acropolis, a sacred precinct for the gods, but the history of the Kerameikos, where the common folk of Athens went about their daily business. Where they lived and died and were buried, for the Kerameikos was a cemetery too. Where you can see the roads that led out through Athens’ walls and the homes where meals were prepared and eaten. In a place like that, where centuries of dirt have been scoured away, you can walk in their footsteps. It’s as close as you’ll ever get to walking beside them. 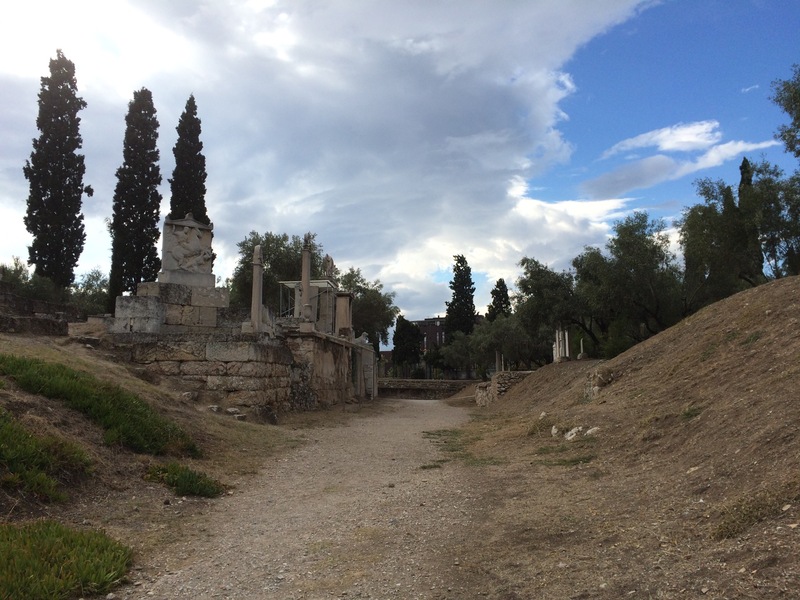 The path of grave markers that led from the Kerameikos.